Learn how the API economy and API management are driving organizations' digital transformation. Learn how to create, secure and provide self-service to APIs across the ecosystem when designing a mobile app. Learn how IBM Partner KS2 uses API Connect to speed integrations and rapidly deliver a wide range of technology solutions. Discover why IBM was named a leader in API management solutions. Learn why IBM was named a leader in full lifecycle API management solutions. Find out the benefits and costs of an investment in an API Management solution. Learn how IBM is helping Walmart decrease time needed to deliver resources to developers, from five days to 10 seconds. Learn the YES BANK approach of using APIs in mobile banking to help them reach new customers and open new markets. Discover why APIs are necessary to your business and which API management vendor is the right choice to help you succeed. Dive into how a variety of business models can be implemented to drive API monetization. Discover the best practices and lessons learned based on interactions between IBM and its clients. 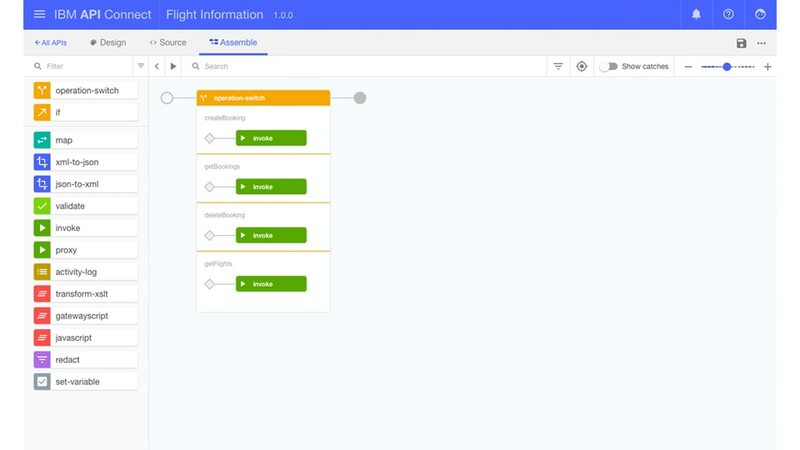 Learn the latest deployment options for API Connect. Learn the suggested RFP criteria to consider when selecting an API management vendor. Evaluate the potential financial impact of API Connect on developing new opportunities for your business. Register for a no-charge one-hour strategy session with an IBM API expert. Hear what IBM customers are saying about API management and read their case studies. Discover, create, publish and secure APIs in a hybrid cloud environment— at no cost—with IBM API Connect Essentials.